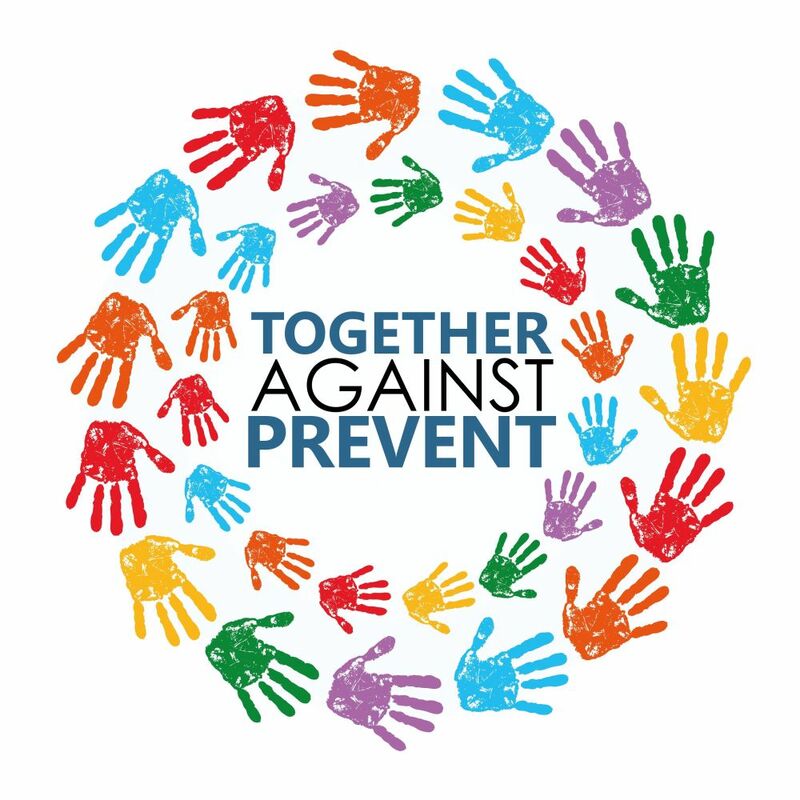 Launched in 2013, Netpol’s annual “Domestic Extremist Awareness Day” takes place on Monday 6 February. This year, we are calling for a complete end to the meaningless but sinister use of the ‘domestic extremist’ label against all legitimate political dissent. 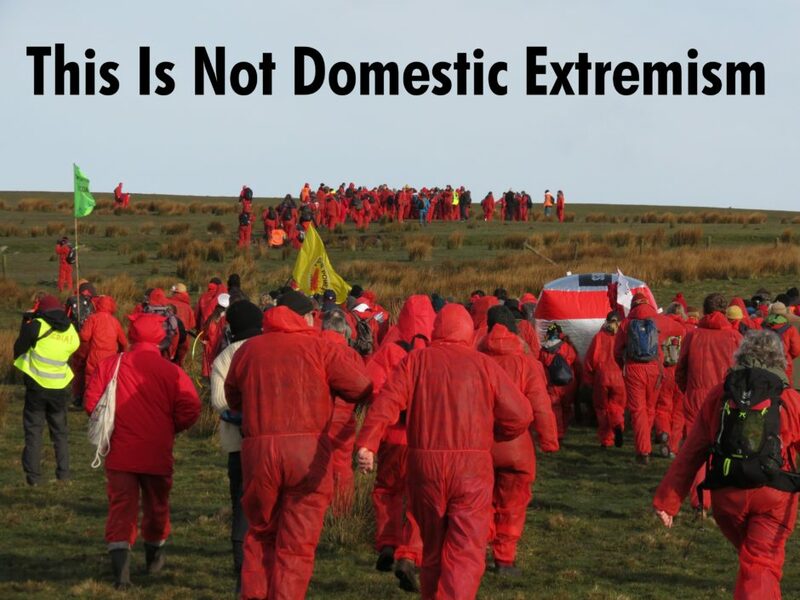 As we have argued repeatedly over the last couple of years, the term “domestic extremist” means pretty much whatever the police want it to mean. It is a critical justification for state surveillance on protest movements in the UK, but both the government and the police have struggled to devise a credible definition robust enough to withstand legal scrutiny. As a result, Prime Minister Theresa May’s flagship counter-terrorism and safeguarding bill, announced back in May 2016, is currently floundering precisely because government lawyers have still been unable to codify ‘extremism’ or ‘British values’ in ways that are compatible with fundamental rights to freedom of speech and freedom of assembly. Despite this, the smearing of campaigners as alleged ‘extremist’ threats has continued. At the end of 2016, opponents of fracking discovered their legitimate activities had been included as alleged ‘domestic extremism’ in the Prevent ‘counter radicalisation’ strategies of a number of schools. The Home Office was forced to concede that “participation in or support for anti-fracking groups would not be considered an indicator that an individual was vulnerable to being drawn into terrorism” (this Freedom of Information request shows the correspondence between an Observer journalist and Home Office officials 302 kB). This concession is, however, far from reassuring, because we know it is untrue. We have documented numerous incidents where anti-fracking campaigners have been targeted as allegedly at risk of radicalisation. So too have other campaigns and the police remain obsessed with finding so-called ‘domestic extremists’ amongst protest groups. Although the National Domestic Extremism and Disorder Intelligence Unit, whose abolition we called for last year, no longer exists, it was simply been absorbed into the even more Orwellian-sounding National Counter Terrorism Police Headquarters. This remains the same secretive, unaccountable driver of mass surveillance on political dissent as the units that preceded it. The Home Office may spin that alleged ‘extremism’ is not considered an indicator of terrorism, but it is still counter-terrorism officers conducting surveillance on political opinions – and adding to vast databases of our activities. Some may argue ‘domestic extremist’ is a label we should feel proud to own, an indicator we are making a difference. We live, however, in uncertain times: events in the US over the last week have shown the power of using discriminatory labels in the name of national security and the impact it has on individuals’ lives. Now the new US administration is not just attacking refugees but is calling the environmental movement “the greatest threat to freedom and prosperity in the modern world”. If people fear the label of ‘domestic extremist’ may in future affect their immigration status or application for asylum, the safety of families in other parts of the world, their job security or their ability to work with children, or the prospect of routine harassment or preemptive arrest by the police, they are far more likely to think twice about exercising their rights of assembly and free speech. This is why we are arguing for a complete end to the smearing of campaigners as ‘domestic extremists’. Our campaigns are not ‘extreme’ just because they challenge powerful state and corporate interests. Taking to the streets and expressing our dissent is a right we can take enormous pride in exercising. 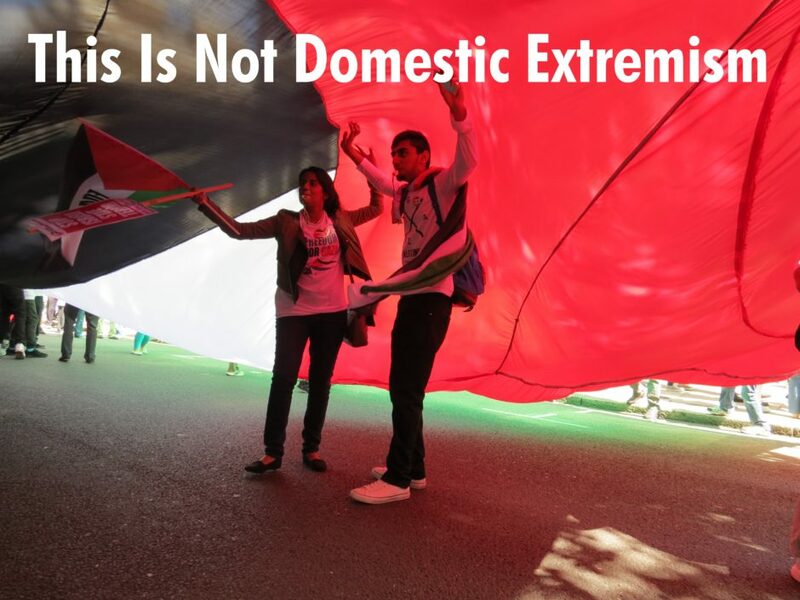 We are therefore asking campaigners to share photos of their protests, actions and assemblies on social media with the slogan “This is Not Domestic Extremism” and the hashtag #DomesticExtremist. If it is also appropriate, we would also like your help in gathering evidence for the European legal challenge against mass surveillance of protesters, by making a data ‘subject assess request’ for the information the police hold about you. If you are interested in helping, please contact us. I’d love to be in touch regarding my status as an extremist but yr contact form was not functioning.